TVGS live-stream starts right now! Hey, all. As promised, we’re working on exporting all the videos we’ve recorded in our Twitch.tv lifestream to Youtube. Here’s the always-up-to-date playlist below. Check it out, and see if your game is in there! For Ludum Dare 32, we hosted our second Ludum Dare Real-World Meeting here at the Tech Valley Game Space (TVGS) in Troy, NY, USA. Compared to our previous hosted event (LD 31) we had a greater number of attendees, including a healthy mix of newcomers and veteran jammers. How did it turn out? Get ready for the super-detailed TVGS post-mortem! So this one is an important question: why would we have a real-world meeting for a game jam that prides itself in being online? The short answer is that a real-world gathering provides a number of distinct advantages, both for jammers and Compo participants, that wouldn’t be possible if one were to work from their own home. To explain these advantages, however, let’s start by discussing some spiritual differences between Ludum Dare and Global Game Jam. First off, I might as well leak this “secret:” yes, the game is a satire of freemium and social games. It was designed like that from the beginning, from the mundane, boring activity of putting clothes into a dryer, to the comically juicy process of collecting coins and trinkets from the lint trap. This isn’t the first time we’ve posted a satire to Ludum Dare — Not a Clone was also a satire — but seeing that this time around, the game was deliberately uninteresting, this developer had very low expectations. Not so, it turns out. A lot of people, both within and outside of Ludum Dare have found the game to be oddly addicting. Many commented how hilariously boring the game was, and still managed to find something fun about it. And a few people even managed to figure out what the game was satirizing about. Anyways, I’ve got to give my thanks to all of you who played and voted for our game. We had a lot of fun this time, and hope to make more games in the future! Let’s Rescue Ludum Dare live stream in a few hours! This time, we’re doing something different. Not only will we take requests, but we’ll also attempt to rescue games with very low ratings. If you want to get your game streamed, I have a form up in the link below, so go right on ahead! Let’s Rescue Ludum Dare Live Stream Tomorrow! Let’s Rescue Ludum Dare Stream on Friday! Phew, what a Ludum Dare adventure that was (and boy am I tired!). 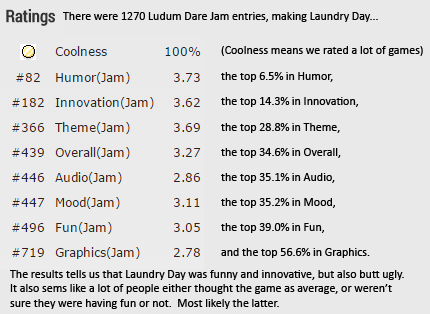 We got nearly the entire Tech Valley Game Space crew to make a satire of free-to-play social games called Laundry Day. And we all learned how to use Construct 2 together! If you can, please rate the game, and let us know what you think! And for those interested, we have a time lapse, too! Make it Juicy presentation starts now! Hey guys. The Make it Juicy: Easy Ways To Make Your Game More Engaging presentation on Twitch.tv starts now! I’ll be discussing about techniques I use to improve the game feel. Edit: The presentation as a highlight is now up, and I’m uploading it to Youtube right now. Edit 2: Now up on Youtube. Reminder: Make it Juicy presentation in 1 hour! Here’s a reminder I’m doing a presentation called Make it Juicy: Easy Ways To Make Your Game More Engaging on 7:00 PM EST via Twitch.tv. I’ll be discussing about techniques I use to improve the game feel. Here’s a reminder I’m doing a presentation called Make it Juicy: Easy Ways To Make Your Game More Engaging on Tuesday, December 2nd, 7:00 PM EST (just 1-day!) via Twitch.tv. I’ll be discussing about techniques I use to improve the game feel. Here’s a reminder I’m doing a presentation called Make it Juicy: Easy Ways To Make Your Game More Engaging on Tuesday, December 2nd, 7:00 PM EST (just 2-days!) via Twitch.tv. I’ll be discussing about techniques I use to improve the game feel.